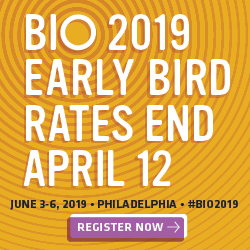 There is also a shift in demand for biologics and biosimilars. In fact, nine of the top-10 drugs available in prefilled syringes are now biologics and the majority of these are used for treating chronic diseases such as diabetes, rheumatoid arthritis, and multiple sclerosis. As the parenteral drug pipeline continues to move from small molecules to complex biologics such as monoclonal antibodies (mAbs) and antibody drug conjugates (ADCs), biological therapies provide unique challenges for parenteral drug delivery, such as volume and viscosity. Other challenges are prevalent as well, including quality concerns, strict regulatory requirements, interaction of prefilled syringes with drugs, manufacturing complexity, combination therapies, and lyophilization. Additionally, aseptic processing of parenterals involves challenges such as protecting the sterility of a product as it moves through each phase of formulation, filtering, filling, and packaging. In this exclusive Drug Development & Delivery report, syringe developers and contract manufacturers discuss how they are overcoming the challenges discussed above and provide a look at some advancements in prefilled syringe technology. Initially in the biologics segment, vials were the gold standard. After conducting trials, the developer would switch to prefilled syringes just before commercial launch, explains Mr. Kovarcik. In cases where clients use alternative primary container systems, Althea works with them to ensure they are compatible with automated filling systems. Critical to prefilled syringes is manufacturing high-quality product the first time. Manufacturing success is dependent on a robust and reproducible process. To this end, Althea has been advocating for its pharmaceutical partners to bring forward their prefilled syringe programs in the earlier stages of development. “That way we can identify any gaps in the production processes, which allows us sufficient time to work through any issues prior to clinical studies and commercial launch,” says Mr. Kovarcik. Aptar Stelmi designs and manufactures elastomeric closures: stoppers for vials, and prefilled syringe and cartridge components such as plungers, needle shields, and tip caps for all parenteral applications. 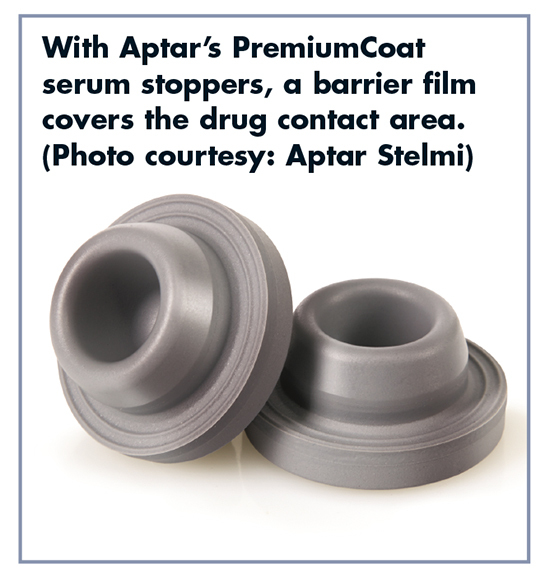 The most recent addition to its product portfolio is the PremiumCoat™ coated serum stopper designed for the protection of sensitive and high-value drugs, including biopharmaceuticals. Based on an approved, pure, state-of-the-art formulation, the surface of the elastomer is coated during manufacturing with an ETFE film. This coating acts as a barrier to many of the extractables and leachables that can be released from the elastomer. As a result, compatibility of the drug and the closure is improved. The first design released in 2015 was the 20-mm coated stopper, and a 13-mm coated stopper will soon be available. A notable trend in the market for sterile injectables has been toward self-injection or autoinjector devices, which have become increasingly popular over the past few years as a means of improving patient compliance and helping prevent needlestick injuries. Catalent has actively supported customers in this market segment by implementing the necessary steps to fully comply with Current Good Manufacturing Practice regulations for devices [21 CFR 820 (cGMP)] from a quality and regulatory assurance viewpoint. The majority of the investment in a typical project is made prior to starting the assembly process and the design is checked and verified prior to starting clinical assembly. Using information gained through the executed process, In-Process-Controls (IPCs), Acceptable Quality Limits (AQLs), Process Control Limits (PCLs), and process reviews need to be implemented and checked for effectiveness. These data must also be supported by a risk assessment and facilitate the drafting of a User Requirement Specification (URS) for a fully automated assembly line. “Due to the precise and unique nature of the autoinjector market, equipment is, in most cases, specifically designed to support each type of autoinjector,” says Mr. Blendeman. The growth of biologic parenterals in the commercial and pipeline portfolios of drug manufacturers has been well documented. 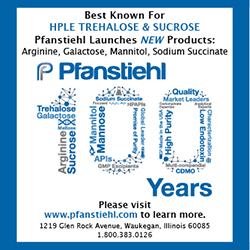 These biologics are often formulated as powders, in lyophilized or spray-dried form, when unstable in solution. Additionally, there are an increasing number of applications requiring separation of two liquid components during storage. Because of this, the number of drugs that require reconstitution or mixing at the point of injection has increased. The conventional approach to reconstitution includes multiple vials, syringes, needles, and/or vial access components, and an arduous mixing and administration process that contribute to inefficient workflow, dosage errors, wasted drug product, and needlestick exposure, explains John A. Merhige, Chief Commercial Officer, Credence MedSystems. The industry has seen attempts to improve upon this approach with vial mixing devices and multi-chamber syringes and cartridges. “While the dual-chamber offerings that are available or in development have been evolving, there remain limitations with regards to efficient manufacturability, supply chain availability, cost, usability, and safety that have placed barriers on adoption,” he says. “With the delivery of healthcare moving from formal medical settings to the home, and medications increasingly being administered by self-injectors, the industry is in need of an injection system that allows those complex biologics requiring point-of-care mixing to be injected easily and safely by less experienced users.” To address this market need, Credence MedSystems has developed and recently introduced its Companion Dual Chamber Reconstitution Safety Syringe technology. 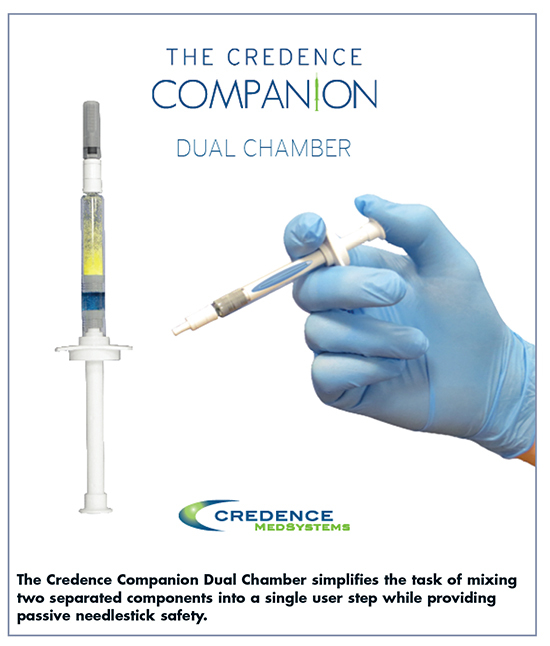 “The Companion Dual Chamber shares the Innovation Without Change design philosophy that is seen across Credence’s other safety syringe systems, maximizing the usability and safety of the device while minimizing the change from existing primary package components and supply chain dynamics,” says Mr. Merhige. The Companion Dual Chamber simplifies the task of mixing two separated components into a single step. The user advances the plunger rod as in a conventional injection, creating a newly formed center channel through the standard stopper, and allowing the contents of the rear chamber to pass into the front chamber where they are combined together for mixing. Beyond the simplification of the mixing process, the Companion Dual Chamber provides important safety and usability features. A pre-attached needle reduces yet another user step, but also provides the key to an integrated passive safety system; the user simply completes the injection (marked by an end-of-dose click) and then the needle automatically disappears through the stoppers and into the plunger rod and syringe barrel. The syringe cannot be reused and is now rendered safe for disposal. Existing approaches to dual chamber devices all use some combination of customized primary package components: bespoke glass barrels with external or internal bypasses, stoppers with specialized internal channels or wiper blades, etc. “These customized components drive high costs, long lead times, captive supply chains, and the potential for product failure and complaints stemming from a dependency on primary package components that do not have a proven history in the field,” says Mr. Merhige. The Companion Dual Chamber uses a standard, uniform diameter glass barrel (syringe or cartridge), standard stoppers, and standard needle shields from well-known component suppliers. Additionally, the Dual Chamber is glue-free, eliminating any risk of interaction between glue and the drug product. “The combination of single-step mixing, end-of-dose cues, passive needlestick safety, and reuse prevention makes the Companion uniquely suited to enable a broader utilization of point-of-use mixing devices in the home and healthcare provider markets,” he says. Recent discussion in the industry has centered on reducing overall healthcare costs by eliminating waste associated with excess drug that is thrown away. For example, many biologic drugs must be infused intravenously by a healthcare professional, typically at a hospital. Healthcare costs could be significantly reduced, compliance increased, and patient convenience vastly improved if patients could safely and easily self-administer such drugs subcutaneously at home without the aid of a healthcare professional, believes Mike Hooven, CEO and President of Enable Injections. To that end, Enable Injections is developing a new class of wearable on-body drug delivery devices capable of delivering higher volumes and viscosities with minimal discomfort. The new generation of wearable injectors feature improvements in construction materials, injections process, and safety features, meant to overcome the challenges of delivering large-molecule and high-volume biologics. 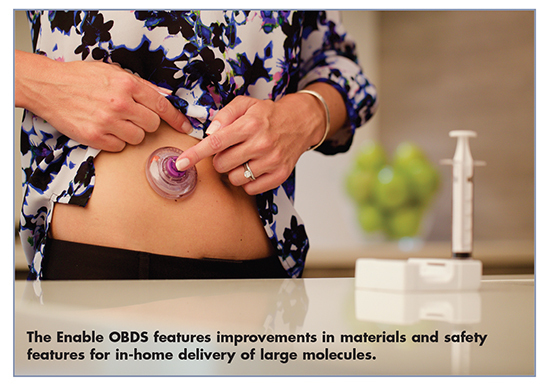 For example, Enable Injections’ on-body delivery system (OBDS) is designed with a proprietary S.E.T. (sequential elastomeric toroid) mechanical drive system. The force required to deliver the drug does not change with the volume, and the needle size is the smallest available, typically 31g. “Advancements with wearable injectors offer the opportunity to revolutionize biological therapy treatments, especially those treating chronic conditions that struggle to attain positive clinical outcomes due to patient adherence,” says Mr. Hooven. The specific requirements of biologics development and production, the obligation to better understand the final product, as well as the latest revision of the FDA Combination Product Guidance have resulted in the more complex qualification of prefillable syringes as the container closure system for new products, says Claudia Petersen, Global Director Business Development Medical Systems, Business Development, Gerresheimer Medical Systems. To address these trends, she believes close and early interaction in the product development cycle between the packaging and/or formulation development departments and the supplier is key to increasing patient compliance. To date, most development-stage and marketed biopharmaceuticals are either monoclonal antibodies or recombinant proteins, each with specific requirements/sensitivities, and need to be administered by injection. “Protein-based drug products have complex requirements that demand customized prefilled syringe solutions,” she says. Custom drug delivery devices with prefilled syringes are a must in the parenteral market because of the vast number of parenteral drugs that exist. That’s why Gerresheimer offers a comprehensive portfolio of high-quality products in glass and cyclical olefin polymers (COP), and adapts the syringe system to the customer’s individual requirements profile. “Gerresheimer is one of a few companies in the world to offer its customers both glass and COP syringes,” says Bernd Zeiss, Medical Systems, Technical Support Manager at Gerresheimer. COP’s barrier properties effectively protect the content of the syringe. COP is also transparent, which means that COP syringes are similar in appearance to glass syringes. This transparency makes it easy to visually check the content for clouding, particulate, and other defects. 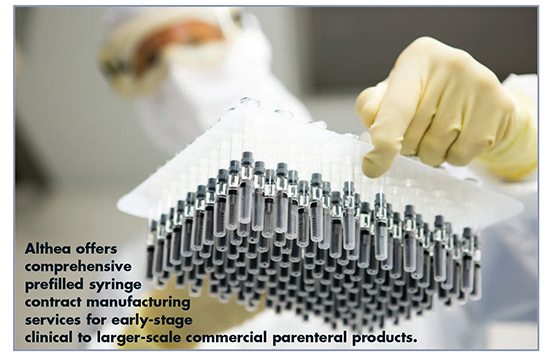 COP syringes can be used as a primary packaging for biotechnologically derived drugs. Since the early 2000s, prefilled syringes have gained popularity due to their ease of use, improved user safety, and the reduction of potential dosage errors. Self-administration, at-home administration, and the rise of biologics are the main drivers of this growth. Indeed, needlestick injuries remain a global concern with more than 3 million exposures to blood every year, according to the World Health Organization. In order to overcome those problems, regulation/recommendations have been established to improve users’ conditions. As a consequence, devices such as safety devices for prefilled syringe or autoinjectors have emerged. While 1-ml prefilled syringes are the common primary container, over the last years—with the rise of biologic drugs—larger volume containers (2.25 ml) have emerged. Those biologics have raised new challenges. “Indeed, on one hand, biologics are adding complexity to the parenteral segment due to the nature of the drug (more viscous and with larger filling volume), while on the other hand biologics are targeting patients suffering from chronic diseases who have to self-inject,” says Adrien Tisserand, Global Category Manager at Nemera. In response, Nemera has developed a 2.25-ml version of Safe’n’Sound®, an open, adaptable, and customizable platform of add-on passive safety devices for prefilled syringes to help prevent needlestick injuries. As a passive safety device, the safety feature activates automatically at the end of the injection, easing the use. User interface has been integrated from the beginning in the design and development of the device, integrating many ergonomic features: a large thumb pad surface to smooth the injection; large built-in finger flange to facilitate handling; a round shape for more comfortable handling; and a spring located at the syringe flange position to provide good visibility of the tip of the syringe and enable inspection of the drug, even with low-filling volume drugs. An optional add-on ergonomic extended finger flange has also been developed to improve the handling, gripping, and comfort for the user. The demand for prefilled syringes continues to grow as more patients are being required to self-administer medications, such as the increasing number of biologics and biosimilars entering the market. 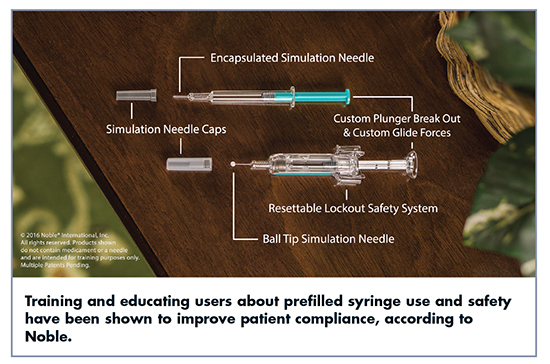 As these products continue to augment and launch into new therapeutic sectors, training and education will remain a critical success factor that will determine a patient’s ability to safely and effectively use prefilled syringes and adhere to therapy, explains Paul Sullivan, Associate Director of Business Development at Noble. Noble is a full-service, patient-centered product development and manufacturing company that specializes in onboarding and device training. Noble works closely with pharmaceutical and biotechnology companies to develop educational and training solutions designed to provide positive patient onboarding experiences, reduce errors, and improve patient outcomes. Mr. Sullivan adds that training devices have been shown to be effective for improving patient outcomes and adherence. Findings also reveal patients who use a training device are more compliant.5 Novel training technologies like simulation needles help promote positive onboarding experiences and empower patients to lead healthier lives. “In the modern era of patient-centric care, products that are able to provide superior onboarding and patient experiences will be well positioned to reduce patient errors, while improving patient satisfaction and outcomes,” he says. Biologics and more complex delivery devices are sensitive to the high temperatures associated with traditional sterilization processes. 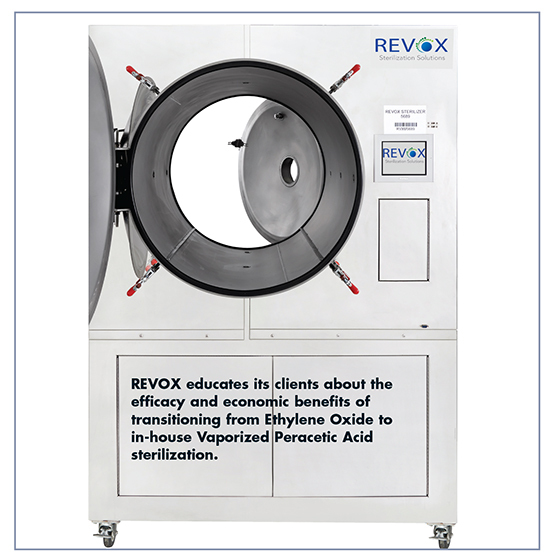 The REVOX vaporized peracetic acid (VPA) sterilization process is conducted at room temperature (21°C), allowing full sterilization of the device without affecting the drug. With regards to syringe manufacturing, significant achievements have been made in recent years. This leads to an overall reduction of cosmetic defects (which otherwise could have an impact on filling operations) and enhanced mechanical strength of the syringe. For example, syringe barrels can be produced with tighter dimensions, which ensures a better fit with safety devices; tungsten residues and siliconization can be controlled in a better way, the latter by diving nozzle technology, resulting in a uniform distribution of the silicon oil inside the barrel; and highly automated handling of the syringe during production helps to further reduce defects. “Looking ahead, patient comfort and safety will become even more prevalent,” says Anil Busimi, Director Strategic Marketing and Innovation, SCHOTT Pharmaceutical Systems. “A very important point is drug container interaction and the determination of extractables and leacheables (E&L). To address this, SCHOTT introduced a new prefillable polymer syringe, designed to improve the safety and stability of sensitive drugs. 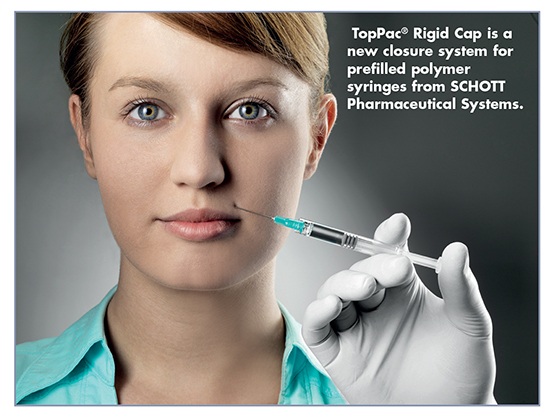 The product, SCHOTT TopPac® SD, offers new features for a reduced E&L profile, such as an inert COC (cyclic olefin copolymer) barrel that releases no ions or heavy metals; cross-linked silicone for barrel lubrication that reduces the amount of subvisible particles and still ensures optimal functionality; and the syringes are sterilized with an ETO (Ethylene Oxide) method, rather than irradiation. Large (bio-)pharmaceutical companies often focus their efforts on core competencies, such as late-phase development and drug marketing. To improve their efficiency in these areas, they are making efforts to reduce and simplify their network of different service providers. “Whenever possible, they purchase a solution that equates to ‘one-stop-shopping,’” says Bernd Stauss, Senior Vice President Pharmaceutical Production/Engineering, Vetter Pharma-Fertigung GmbH & Co. KG. But it’s not just single sourcing in partners that matters to pharma. An all-in-one concept is also appealing with regard to prefilled syringe technology and the issue of lyophilization. Dual-chamber systems offer advantages in this sector. The Vetter Lyo-Ject® dual-chamber syringe is designed for sensitive drugs that will not degrade in a lyophilized state. 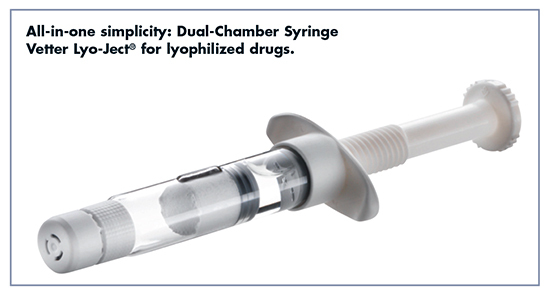 The actual active ingredient is lyophilized in one chamber, while the other chamber of the syringe contains a solvent that is mixed with the active substance immediately before application. “This all-in-one concept enables a long shelf life as well as easy handling. This also means higher yields of your active product ingredient and precision in dosing,” says Mr. Stauss. In addition to package design, packaging material plays an important role. For instance, Mr. Stauss says it can be a challenge to determine the right amount of silicone that will enable the correct movement of the plunger rod while avoiding any form of interaction between the silicone and the drug substance. Consider this real-life example. High-value products are often based on very complex compounds. This means that these compounds demand a high degree of accuracy on the filling line. As a manufacturer, Vetter has to deal with the increased sensitivity to manufacturing processes and environmental conditions. One highly sensitive API required very small fill volume in a syringe device. “Small filling volumes create an increased demand on all production areas, including process design, technical equipment, and packaging material,” he explains. As such, packaging material and processes needed to be adapted to meet the requirements of this product. Last year saw the first FDA-approved biosimilar. Advanced drugs, like biologics and biosimilars, require sophisticated packaging and drug delivery systems, and the market has responded with offerings that address this new need. In the case of biosimilars, with many companies competing for the same therapy, the mechanism of administration can be a key differentiator. West’s contribution to this evolution has included Daikyo Crystal Zenith® cyclic olefin polymer (COP), which is used to produce a technologically advanced COP containment and delivery system. Crystal Zenith is proven to complement biopharmaceuticals and other complex, high-value medicinal products because it addresses the need for clear, biocompatible material that helps mitigate the chemical interaction and breakage risks inherent in glass, says Mike Schaefers, Vice President, Global Product Management and Marketing Operations, West Pharmaceutical Services, Inc.
“For injectable biosimilars currently in the pipeline, it will be important to examine drug delivery options that can improve the patient experience while ensuring, when possible, a delivery format with which patients are familiar and comfortable,” says Mr. Schaefers. Focusing on enhancing quality from early development through commercialization, West adopted Quality by Design (QbD) concepts in the design and manufacturing of packaging components. QbD delivers an improved, data-driven output, providing superior product and process understanding that minimizes risk, emphasizes patient-critical quality requirements, and enhances drug product effectiveness. For example, West’s NovaPure® plungers incorporate functional performance parameters like gliding and breakloose forces, which are very important to ensure consistent injectable drug administration when syringes are used in combination with an injection device. And when it comes to the popularity of combination products, drug manufacturers are more heavily relying on companies like West to offer insight into the regulatory process related to components. “Our expertise around how drugs may interact with the delivery systems can help to avoid regulatory delays, increase safety and expedite the process of getting combination products to market,” says Mr. Schaefers. Additionally, combination products have also brought to the forefront the importance of flexible manufacturing, which enables drug companies to quickly transition fill lines from vial format to cartridge to prefilled syringes, depending on the needs of the injectable medicine. 1. The Future of Alliances and Partnerships in the Pre-Filled Syringes Market to 2020, Smithers Rapra, http://www.smithersrapra.com/market-reports/medical/the-futureof-alliances-and-partnerships-in-the-pr, accessed April 13, 2016. 2. Global Prefilled Syringes Market Size, Share, Development, Growth and Demand Forecast to 2020 – Industry Insights by Type (Glass Prefilled Syringe, Plastic Prefilled Syringe), Reportbuyer, http://www.prnewswire.com/news-releases/global-prefilledsyringes-market-size-share-development-growth-and-demandforecast-to-2020–industry-insights-by-type-glass-prefilled-syringeplastic-prefilled-syringe-300217393.html, accessed April 13, 2016. 3. Bolstering Capabilities for Parneteral Drug Development and Manufacturing, AAI Pharma, http://www.niceinsight.com/Userfiles/Articles/PDFs/PA_1015_AAIPharma.pdf, accessed on April 13, 2016. 4. U.S. Department of Health and Human Services. (n.d.). Health Literacy – Fact Sheet: Health Literacy Basics. Retrieved from http://health.gov/communication/literacy/quickguide/factsbasic.htm. 5. The link between device training and patient compliance. Noble, Poster session presented at PDA, Universe of Prefilled Syringes 2015, Vienna, Austria.